What Does Feminism in Ballet Look Like? Georgina Pazcoguin as Hippolyta in Balanchine's A Midsummer Night's Dream. Photo by Paul Kolnik, Courtesy NYCB. In January, when news broke that Peter Martins had retired from New York City Ballet amid allegations of sexual harassment and physical and verbal abuse, I was sitting with my mother, a former dancer and teacher. We stared at the headline in shock, wondering what this meant for the future of ballet as a whole: In the wake of the #MeToo and #TimesUp movements, cultural shifts were stirring, and conversations about feminism and workplace equality plunged into ballet. Some of my favorite dancers started sharing their statements and stances on Instagram, and their comments sections were bursting with dancers and ballet fans all struggling to define what feminism and equality in our art form would look like—or if it is even possible. Especially since female dancers have historically been considered muses to be seen and not heard, to perform but not lead. Feminism isn't just possible in ballet—it's necessary, and the biggest part of that is an artistic advantage, too: empowering dancers to have and use their own voices. Kyle Abraham's "Untitled America" for Ailey. Photo by Paul Kolnik. As it turns out, Martins left room for Justin Peck, Rebecca Krohn, Craig Hall and Jonathan Stafford to select two of the company's six commissions for the 2018-19 season. Their choices—Kyle Abraham and Emma Portner—are surprising, and thrilling. Neither choreographer has made work on a large ballet company before, though Abraham created a duet with Wendy Whelan for her "Restless Creature" series, among his other commissions for companies like Alvin Ailey American Dance Theater and work for his own company. And though Portner has been a favorite in commercial circles for a few years now, the concert commissions have just recently started rolling in: This fall she'll be collaborating with Lil Buck and Dev Hynesfor a full-length work for Hubbard Street Dance Chicago, and working with Anne Plamondon on a Fall for Dance North piece. Peter Martins. Photo by Adam Shankbone, Courtesy Wikimedia Commons. The New York Times reports that a two-month long internal investigation into sexual harassment and physical abuse allegations against Peter Martins, New York City Ballet's former ballet master in chief, has found that the accusations could not be corroborated. In December, an anonymous letter sent to NYCB and its affiliated School of American Ballet accused Martins of sexual harassment, although the claims were non-specific. Afterwards, several former dancers and one current company member came forward to the press accusing him of physical assault and verbal abuse. Martins, who directed the company for 35 years and has denied the accusations, retired on New Year's Day after taking a leave of absence. An interim team led by ballet master Jonathan Stafford has been overseeing the company in the meantime. Yesterday evening, Peter Martins announced his immediate retirement as New York City Ballet's ballet master in chief through a letter to the company's board. He had been solely in charge of the company's artistic direction since 1989 and the School of American Ballet's chairman of faculty since 1983. Since December 7, Martins had been on a self-requested leave, amidst an investigation of claims of sexual harassment as well as physical and verbal abuse. In the letter, he stated, "I have denied, and continue to deny, that I have engaged in any such misconduct." However, earlier articles from The New York Times and The Washington Post conveyed accounts of verbal and physical abuse by NYCB dancers, both past and present. In 1992, Martins was charged with third-degree assault of his wife Darci Kistler, though the charges were later dropped. Despite Martins' resignation, the board emphasized in a statement, also released on Monday, that the investigation will continue until it is completed and that "the board takes seriously the allegations that have been made against him." 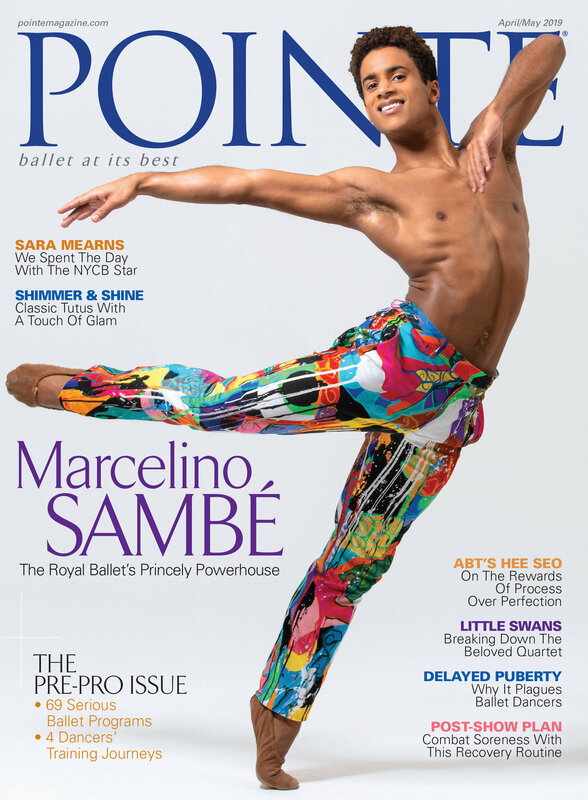 To keep reading, go to dancemagazine.com. As the investigation into claims of sexual harassment by New York City Ballet ballet master in chief Peter Martins remains under wraps, more dancers are speaking publicly on the matter. And while many allegations are decades old, dancers with recent and current ties to the company are becoming more vocal. Yesterday, Kathryn Morgan—a former NYCB soloist with a hugely popular YouTube channel and an advice column in Dance Spirit—posted a candid video addressing questions she's received about the scandal. Although Morgan left the company in 2012, her post sheds light on the mixed emotions that current NYCB dancers may be feeling right now. "This is an issue that NEEDS to be discussed," she writes in the comments section. "And I appreciate that you all understand I am in no way defending him. I just wanted to give you my honest and true experience with dealing and working with Peter." From left: Justin Peck, Rebecca Krohn, Jonathan Stafford and Craig Hall. Photo by Erin Baiano, Courtesy New York City Ballet. The New York City Ballet Board of Directors announced on Saturday the interim team that has been appointed to run the artistic side of the company during ballet master in chief Peter Martins' leave of absence. Martins requested a temporary leave from both NYCB and the School of American Ballet last Thursday while the company undergoes an internal investigation into the sexual harassment accusations aimed at him. The four-person group is made up of members of the company's current artistic staff, led by ballet master and former principal dancer Jonathan Stafford. Joining Stafford are NYCB resident choreographer and soloist Justin Peck and ballet masters Craig Hall and Rebecca Krohn, both former dancers with the company. While the members of this group haven't had much leadership experience, their close familiarity with the company (Krohn left the stage for her new role just two months ago) should help to ease the dancers' transition. The team will be responsible for the day-to-day artistic needs of the company including scheduling, casting and conducting rehearsals. While there's no word yet on the length of their tenure, we'll continue to keep you updated as the story surrounding Martins unfolds.